Are “Demographic-Based” Museums A Sign That Museums Aren’t All Inclusive? A few weeks ago Meryl Streep did something awesome. She donated her salary from The Iron Lady to the National Women’s History Museum (NWHM). She also won a Golden Globe – which is also awesome – but not the focus here. Not only did she donate her salary, when asked to appear on the cover Vogue (January 2012 issue), she stipulated that a group of powerful Washington women, who are all involved in getting the NWHM built and operating, be included. Who are these women? Joan Wages (President & CEO of the NWHM), Sen. Susan Collins, former Secretary of State Madeleine Albright, poet Maya Angelou, Sen. Barbara Mikulski, Rep. Carolyn Maloney, Del. Eleanor Holmes Norton, and former first-daughters Barbara Bush and Patricia Nixon Cox. That is an impressive group of women! The NWHM bill was attached to other legislation supported by Committee Chairman John Mica (R-FL) and re-introduced as HR 2844, the National Women’s History Museum and Federal Facilities Consolidation and Efficiency Act of 2011. Representative Carolyn Maloney (D-NY) is a cosponsor of the bill. The legislative language in the new bill revises and further clarifies the boundaries of the site that NWHM will be allowed to purchase at 12th Street and Independence Avenue, SW., adjacent to the National Mall. This change eliminates any questions as to Congressional intent and will be helpful in site negotiations with the General Services Administration (GSA), the nation’s landlord. The NWHM has a long way to go (the NWHM was founded in 1996 by Karen Straser) before they have a building on the National Mall but they certainly have the passion, drive and star power to bring this museum to fruition. Women’s contributions and accomplishments for the most part have been overlooked and consequently omitted from mainstream culture. The National Women’s History Museum will help fill that void. Rather than rewriting current exhibitions at other history museums or having to decide what to omit elsewhere to “fit in” women’s history, the NWHM will serve to place women’s history along side current historical exhibitions. Women’s history is half of our national story. The objective is to promote scholarship and expand our knowledge of American history. Which begs the question: Are “demographic-based” museums a sign that museums aren’t all inclusive? Are [demographic-based museums] a sign that museums have not fulfilled the public-history promises to be inclusive and engaging with people of all demographics? Do museums do their best work when they are tightly focused on a single demographic? Does the National Museum of American History (NMAH) now have an excuse to work less diligently to include women’s history in its exhibits? These are all fabulous questions. There is no doubt that at one time museums were for the upper class, well to do, highly educated and directed primarily by white men. Times have changed and continue to change in the museum field. We talk about not only engaging but serving our communities, reaching underserved populations, increasing interactivity and user-generated content making museums “open-source.” In doing all of this, are we forgetting to “update” the content in our institutions? Do our collections policies need to change? Do our communities see themselves in or connect with our exhibitions? I don’t know the answers to all of these questions but I would love for you to share your thoughts. Let’s start a discussion. Tags: Barbara Bush, Del. 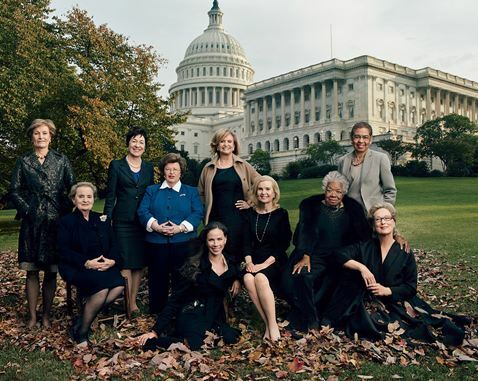 Eleanor Holmes Norton, Frances Ellen Watkins Harper, Joan Wages, Karen Straser, Madeleine Albright, Maya Angelou, Meryl Streep, National Mall, National Museum of African American History, National Museum of American History, National Women’s History Museum, NWHM bill, Patricia Nixon Cox, Rep. Carolyn Maloney, Sen. Barbara Mikulski, Sen. Susan Collins. Bookmark the permalink. On one hand, I feel it’s imperative for museums to make concrete efforts to reach out to all communities and represent a variety of stories via objects, exhibitions or public programs. Even museums that have an extremely narrow focus (for instance, an art museum dedicated solely to the work of one artist) can provide a variety of narratives with some careful research and a lot of imagination and input from the communities they serve. On the other hand, I know how frustrating it is to visit these spaces and feel that your history is under- or never represented. Thus the rise of museums devoted to specific genders, cultures, ethnic groups, etc. The desire to tell your story in its entire breadth and scope (and not have it relegated to one week or month of the year) is very powerful. If we are to believe that history is written by the victors, it is clearly evident that for far too long individuals in the so-called “dominant” culture have been in charge of the narrative. On a side note, there is also much value in reflecting a variety of cultures in your staff and volunteers, another area in which many museums fall short. All that being said, I don’t feel that museums should absolve themselves of telling those stories because demographic-specific museums exist; rather they should pursue opportunities for collaboration. I think many people feel that women’s history is underrepresented, hence the creation of a “women’s museum”. I think it’s important to tell the other side of the story too – one that’s not about the rich, white man. I don’t think it’s being exclusive – many people already know the mainstream story. I think introducing museums that are dedicated to a specific gender, ethnic group etc. provide knowledge that is extremely important and compliments the already existing story. Hi, good questions. I wrote about this issue recently too at Museum Commons. Also the Smithsonian is hosting a webinar on the evolution of culturally specific museums on April 25 or 26. I think it will be called (Re)Presenting America. I agree with Adrianne, that existing museums should look for collaboration opportunities with new demographic-specific museums. On the one hand, I’m not too worried about museums absolving themselves of telling the stories of historically less-represented demographics, simply because museums will try to make themselves relevant to these audience interests rather than leaving the work to other museums. If someone comes into the National Museum of American History and asks about women’s history-related artifacts, will NMAH send them elsewhere? No, they’ll probably talk up everything they do have, hoping to entice the visitor to come *here. * Since 2011, a wide range of museums have done special programming or emphasized what they have relating to the Civil War, as it’s the 150th anniversary. The same thing happens when it’s Black History Month, Women’s History Month, etc. – lots of museums want in on the commemoration, hoping to draw visitors in. On the other hand, some demographics are still largely ignored by the museum world. DC’s Hillwood Estate, Museum, and Gardens is unique in its outreach to the gay community, for example.